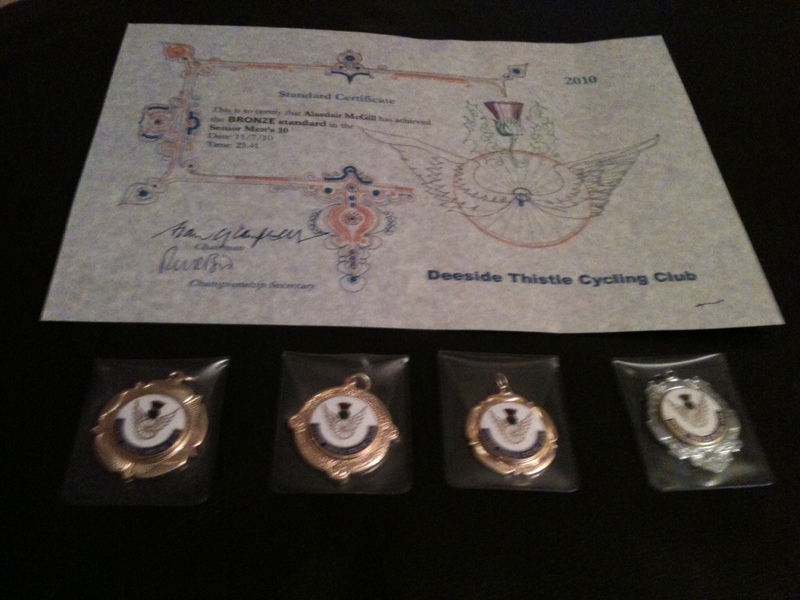 I joined the Deeside Thistle Cycling Club back at the end of 2006 and started racing in 2007. It was nothing special that first season. It was more about finding my feet and learning the ropes in the new world of bike racing. I remember going to the Christmas lunch & prizegiving at the end of 2007 and watching everyone collecting their awards, wondering if I would ever be good enough to be up on that stage. Last year, it turned out that I had actually ridden a couple of times that qualified me for medals, but due to an administrative error they weren’t awarded at the prizegiving. I was given them in an envelope at a committee meeting in February. Not quite the same. Having had a great time-trialing season, hammering my 2009 PB’s, I was hopeful that I’d have some loot to collect at our prizegiving today. And so it turned out! My times had earned me gold medals at Vet Standards for 10, 25 & 50, Silver at 25 for Seniors (23-39) and Bronze at 10 for Seniors (the certificate). What’s more, our Chairman Alan Campbell presented me first rather than in alphabetical order, and told everyone (there were about 70 people there) about my broken collarbone. Cue lots of concerned questions and discussions of others’ broken bones. Almost everyone, it seems, has broken their collarbone at some stage! What had seemed an impossible dream back in 2007 as I started out in this sport had now become a reality. I’m pleased with that! Previous Post I’m Glad I Broke My Collarbone! From what I read in this blog, I am proud to know you. Awesome sauce! Medals are the best, nothing quite like something shiny to commemorate an achievement. I don’t know if I’ll ever join a running club, they seem awfully scarey and intense and all the women are extremely skinny and fast. Perhaps I need to wait until I meet all of those criteria but I don’t know if that’ll happen any time soon! I know David – it’s *REALLY* hard to believe!! !